Drivetrain: The hybrid uses a 154-horsepower, 2.0-liter four-cylinder and a 38-kilowatt electric motor for a combined 193 hp, mated to a six-speed automatic transmission; the plug-in hybrid pairs the 2.0-liter four-cylinder with a 50-kW electric motor for a combined 202 hp, also mated to a six-speed automatic. The Hyundai Sonata's electrified hybrid and plug-in hybrid models, debuting at the 2018 Chicago Auto Show, return for 2018 with the styling and interior updates rolled out last summer for the Sonata mid-size sedan's 2018 gasoline models. While the hybrid will be generally available, Hyundai says the plug-in version will be distributed in California, Connecticut, Maine, Maryland, Massachusetts, New Jersey, New York, Oregon, Rhode Island and Vermont, but it will be a special-order model in other states. Pricing for 2018 models has yet to be announced; the 2017 hybrid started at $26,885, and the plug-in model started at $35,485. But the plug-in currently also qualifies for a federal tax credit of $4,919. The electrified models get the 2018 design update that includes a new front end with Hyundai's "cascading grille," stronger sculpting, bigger openings and vertical LED daytime running lights. A new headlight shape stretches up and back; LED headlights are optional. The side panel below the doors and rear end are reshaped, as well, but the hybrids don't get the gasoline models' dual chrome exhaust tips. The hybrids get distinctive flatter, aerodynamic 16-inch and 17-inch wheel designs. The interior gets a new center display and controls for 2018. The standard 7-inch touchscreen (or 8-inch with optional navigation) is positioned slightly higher and is easier to see and reach. The arrangement of buttons and controls is cleaner. Other tech improvements include wireless phone charging for navigation-equipped models and an added USB port for the rear seat. In the instrument cluster, a hybrid power and charge indicator occupy the gasoline model's tachometer space, and the touchscreen system gets additional hybrid-specific displays such as hybrid energy flow and specialized hybrid fuel-economy report. Like the gasoline models, the hybrids come with three years of free Hyundai Blue Link connected emergency, remote and guidance services that can be accessed via computer, a smarphone app, and Amazon Alexa skill and a Google Assistant app. The gasoline Used Engines in the hybrid and plug-in hybrid is a 2.0-liter four-cylinder that puts out 154 horsepower and 140 pounds-feet of torque, and both use a six-speed automatic transmission (not a continuously variable-ratio automatic more typical of hybrids). The hybrid powertrain adds a 38-kilowatt electric motor for a combined powertrain output of 193 hp, and it can run on electric power alone up to 75 mph. The system's 1.76 kilowatt-hour battery is packaged under the trunk floor, allowing the hybrid to keep a 60/40-split folding rear seat back to expand the 13.3 cubic feet of trunk space. 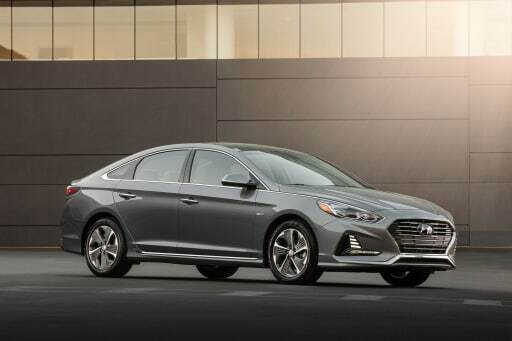 Hyundai estimates the 2018 Sonata Hybrid SE (the highest-mileage model) will be EPA-rated 39/45/42 mpg city/highway/combined as it was in 2017 (the other trim levels were rated 38/43/40 for 2017). That is competitive but lags mid-size hybrid sedan mileage leaders from Toyota, Honda and Chevrolet. Compare them here. The plug-in hybrid gets a more powerful 50-kW electric motor coupled with the gasoline Used Engines for a combined system output of 202 hp. The 9.8-kwh battery provides 27 miles of all-electric range on the plug-in charge before the gasoline Used Engines is needed. That's also the same as the 2017; compare with the rival Kia Optima and Ford Fusion Energi plug-in hybrid mid-size sedans here. A full charge takes about three hours on 240 volts, and about nine hours on a standard household outlet. The hybrid models also get the same suspension and steering improvements as the conventional 2018 Sonatas. The 2018 Sonata received the top score of good in Insurance Institute for Highway Safety crash tests and is rated a Top Safety Pick Plus when equipped with the optional LED headlights and front crash prevention system. Standard advanced safety technology includes a blind spot warning and a rear cross-traffic alert. Newly available for these models is a front collision system with automatic emergency braking and a lane keep assist. Automatic high beams also are optional.